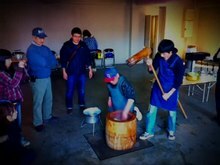 The pounding process of making mochi originates from China, where glutinous rice has been grown and used for thousands of years. A number of Aboriginal Chinese tribes have used this process as part of their traditions. In folklore, the first mochitsuki ceremony occurred after the Kami are said to have descended to Earth, which was following the birth of rice cultivation in Yamato during the Yayoi period (300 BC – 300 AD). Red rice was the original variation used in the production of mochi. At this time, it was eaten exclusively by the emperor and nobles due to its status as an omen of good fortune. During the Japanese Heian period (794–1192), mochi was used as a "food for the gods" and in religious offerings in Shinto rituals performed by aristocrats. In addition to general good fortune, mochi was also known as a talisman for happy marriages. Mochi continues to be one of the traditional foods eaten around Japanese New Year, as it is sold and consumed in abundance around this time. A special type, called kagami mochi (mirror mochi), is placed on family altars on December 28 each year. Kagami mochi is composed of two spheres of mochi stacked on top of one another, topped with an orange (daidai). On this occasion, which was originally practiced by the samurai, the round rice cakes of kagami mochi would be broken, thus symbolizing the mirror's opening and the ending of the New Year's celebrations. Kinako mochi is traditionally made on New Year's Day as an emblem of luck. 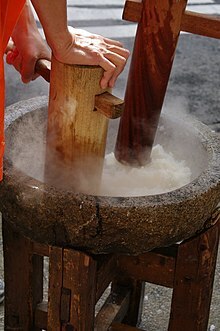 This style of mochi preparation involves roasting the mochi over a fire or stove, then dipping it into water, finally coating it with sugar and kinako (soy flour). Children's Day is celebrated in Japan on May 5. On this day, the Japanese promote the happiness and well-being of children. Kashiwa-mochi and chimaki are made especially for this celebration. Kashiwa-mochi is white mochi surrounding a sweet anko filling with a Kashiwa oak leaf wrapped around it.Chimaki is a variation of a dango wrapped in bamboo leaves. Hishi mochi is a ceremonial dessert presented as a ritual offering on the days leading up to Hinamatsuri or "Girls' Day" in Japan. Hishi mochi is rhomboid-shaped mochi with layers of red, green, and white. The three layers are coloured with jasmine flowers, water caltrop, and mugwort. The caloric content of a matchbox-sized piece of mochi is comparable to that of a bowl of rice. Japanese farmers were known to consume it during the winter to increase their stamina, while the Japanese samurai took mochi on their expeditions, as it was easy to carry and prepare. 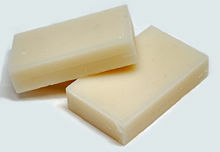 Mochi is gluten- and cholesterol-free, as it is made from rice flour. Sakumochi (索餅）is deep fried rice cake twisted into a rope shape. It is often consumed during the Japanese Star Festival called Tanabata. There is some confusion about its origin based on evidence from historical records of a dish called sakubei (索べい), which some scholars believe was a confection while others think it was an early form of the wheat noodle somen. (Sakubei was made from a mixture of wheat flour and rice flour). In Taiwan, a traditional Hakka and Hoklo pounded rice cake was called tauchi (Chinese: 豆糍; Pe̍h-ōe-jī: tāu-chî) and came in various styles and forms just like in Japan. Traditional Hakka tauchi is served as glutinous rice dough, covered with peanut or sesame powder. Not until the Japanese era was Japanese-style mochi introduced and gain popularity. 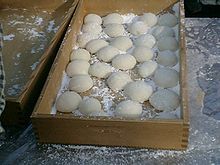 Nowadays, Taiwanese mochi often comes with bean paste fillings. In Hong Kong and other Cantonese regions, the traditional Lo Mai Chi (Chinese: 糯米糍 no6 mai5 ci4) is made of glutinous rice flour in the shape of a ball, with fillings such as crushed peanuts, coconut, red bean paste, and black sesame paste. It can come in a variety of modern flavors such as green tea, mango, taro, strawberry, and more. In Indonesia, kue moci is usually filled with sweet bean paste and covered with sesame seeds. Kue Moci comes from Sukabumi, West Java. In Malaysia, kuih kochi is made from glutinous rice flour and filled with coconut filling and palm sugar. Another Chinese Malaysians variant, loh mai chi is made with same ingredients but their fillings are filled with crushed peanuts. ^ "Mochitsuki: A New Year's Tradition". Japanese American National Museum. ^ The Oxford Companion to Sugar and Sweets. ^ Itoh, Makiko (30 December 2011). "Rice takes prized, symbolic yearend form". The Japan Times Online. Retrieved 16 February 2016. ^ Caile, Christopher. "Kagami Biraki: Renewing the Spirit". Fighting Arts. Retrieved 27 February 2016. ^ a b c d "Japanese confectionery". Travel Around Japan. Retrieved 10 March 2016. ^ Spacey, John. "What is Hishimochi?". Japan Talk. Retrieved 15 March 2016. ^ Okita, Yoko (2015). "Mochitsuki-An International Student Exchange Event Between Juntendo University and Tokyo Medical and Dental University" – via Juntendo University. ^ a b c "Processing Rice's Treasures - The Japanese Table - Food Forum Previous Editions - Food Forum - Kikkoman Corporation". www.kikkoman.com. Retrieved 2016-03-18. ^ "Not-So-Stressful Microwave Mochi". The Fatty Reader. ^ a b "Mochi Making Then and Now". www.discovernikkei.org. Retrieved 2016-03-18. ^ Itoh, Makiko, "Rice takes prized, symbolic yearend form", Japan Times, 30 December 2011, p. 14. ^ Matsue, Yuji; Uchimura, Yosuke; Sato, Hirokazu (2008). "Estimation of Hardening Speed of "Mochi" of Glutinous Rice from the Gelatinization Temperature, an Amylographic Characteristic, and the Correlation of the Hardening Speed with Gelatinization Temperature and Air Temperature During the Ripening Period(Quality and Processing)". Japanese Journal of Crop Science. 71: 57–61. doi:10.1626/jcs.71.57. 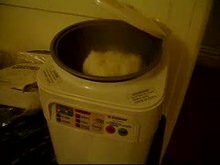 ^ a b c "How rice cake is made - production process, making, history, processing, parts, components, product, machine, History". www.madehow.com. Retrieved 2016-03-18. ^ "Shiratamako • Just One Cookbook". Just One Cookbook. 2014-03-12. Retrieved 2016-03-18. ^ "Sweet Mochi Recipe – Japanese Cooking 101". www.japanesecooking101.com. Retrieved 2016-03-18. ^ "Calories in Japanese Mochi - Calories and Nutrition Facts | MyFitnessPal.com". www.myfitnesspal.com. Retrieved 2016-03-18. ^ a b c Bemiller, James N.; Whistler, Roy L. (2009-04-06). Starch: Chemistry and Technology. ISBN 9780080926551. ^ "Iodine-Potassium iodide - Solution" (PDF). ^ Hermansson, Anne-Marie; Svegmark, Karin (1996-11-01). "Developments in the understanding of starch functionality". Trends in Food Science & Technology. 7 (11): 345–353. doi:10.1016/S0924-2244(96)10036-4. ^ Laovachirasuwan, Pornpun; Peerapattana, Jomjai; Srijesdaruk, Voranuch; Chitropas, Padungkwan; Otsuka, Makoto (2010-06-15). "The physicochemical properties of a spray dried glutinous rice starch biopolymer". Colloids and Surfaces B: Biointerfaces. 78 (1): 30–35. doi:10.1016/j.colsurfb.2010.02.004. PMID 20307959. ^ "Dietary carbohydrate composition". www.fao.org. Retrieved 2016-03-11. 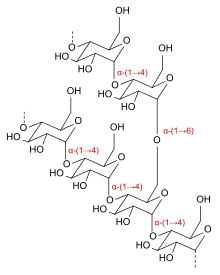 ^ "07-2: Structure of Starches | CHEM 005". online.science.psu.edu. Retrieved 2016-03-14. ^ Lee, Yong-Hwan; et al. (2001). "Changes in Chemical Composition of glutinous rice during steeping and Quality Properties of Yukwa". Korean Journal of Food Science and Technology. Retrieved 2016-03-13. ^ Kilham, Christopher (1996-10-01). The Whole Food Bible: How to Select & Prepare Safe, Healthful Foods. Inner Traditions / Bear & Co. ISBN 9780892816262. ^ a b "Mochi hazards". ^ Nagata, Kazuaki (19 March 2008). "'Mochi' moffles reinvent the waffle" – via Japan Times Online. ^ Ishige, Naomichi. History Of Japanese Food. Routledge. p. 77. ^ "Welcome citrusandcandy.com - BlueHost.com". www.citrusandcandy.com. Pounding Mochi with the Fastest Mochi Maker in Japan, YouTube.